RT’s Close-Up team takes you to one of the coldest parts of Russia - inside the Arctic Circle to the Nenets Autonomous Area, where the average winter temperature is minus 20 degrees centigrade. The region has a very rich cultural heritage and history. It is vast, beautiful and the culture of the people there is absolutely amazing. The region's capital, Narian-Mar, has only a little more than 20,000 citizens. 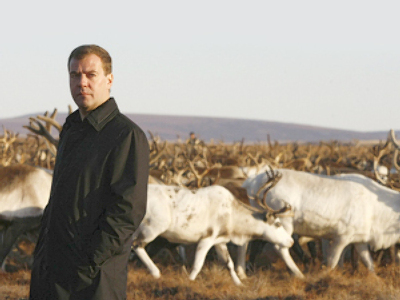 Here, in the remote parts of the tundra, reindeer herding is the traditional industry of this region. However, locals say it is not just their job – it's also their means of survival. The traditional Nenets people are nomadic reindeer herders. Though in many ways they lead a simple and rustic life, they are also very skilled and organized in their trade. Their reindeer depend on pastures so they constantly move from one spot to another. For the Nenets people, the deer mean practically everything in their lives: they are a means of transportation; a source of power and equipment. A deer means clothes and covers for the outside and inside of their skin tents. Life in the tundra is harsh, so before winter comes, many of the local children are taken to Naryan-Mar by helicopters to boarding school. The head of the local boarding school, Aleksandr Shamov, says his educational institution was set up back in 1946 to provide education especially for those kids who do not have access to normal schooling. “All the children come from ethnic minorities; they grow up in ethnic families. That is why a great deal of attention is paid to the national, ecological and folk components in educational programs that best reflect the living conditions, the habitat of the children,” he says. In Naryan-Mar, the Nenets students learn different languages and modern technology through special grant programs, and even learn art skills – all within a protected environment. However, even with the most progressive ideas and education, many Nenets say they do not want to trade modern life for their beloved tundra. In 1993 an agreement between Finland, Norway and Russia was signed on the co-operation in the Barents Sea area to realize of projects dedicated to Northern indigenous people, their cultures, and environmental, educational and business issues. Andrey Vokuev, spokesman of Norwegian Barents Secretariat, says the environmental questions are of particular importance to this organization, because the tundra’s nature is very sensitive. Christina Henderson, advisor on indigenous people at the Norwegian Barents Secretariat, believes the Nenets Autonomous Area is “the best place to be in Russia”. She says different indigenous groups living in the region share the same values: they want to protect the environment they live in. The Nenets people are very enthusiastic in preserving their traditions and culture, Henderson said. To discuss more to-the-ground matters, RT has caught up with Ludmila Istomina, a local resident for more than 40 years, who has now moved to another part of Russia, but came to Naryan-Mar for a visit. In the days of her childhood in the 1950s, the region was very poor, and most people lacked warm clothing. In a climate where 10 months a year the temperature is freezing, it was a big problem which people simply had to find ways of dealing with.